In this article we will present how to create a simple form that allows the user to preview the data he is about to submit. 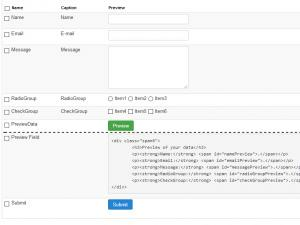 First you will need to create a multi-page form from Components > RSForm!Pro > Manage forms > New. * the totalPages refers to the total number of pages your form will have. * the validateOnChangingPage refers to the 'Validate on changing page' functionality of a multipage form. You can set this value to either "true" or "false" depending if you want the form to validate the input when changing pages or not. Important: When specifying values for "previewPageNumber" and the "totalPages", note that the actual pagination starts from 0 (zero). For example, the third page will actually be 2, the first page 0 and so on. /*...this will copy the value of the "Name" field in the "namePreview" span. 32 persons found this article helpful.